After a year of fits and starts with this blog, I unofficially took a few months off (you may have noticed my last post was in September, and even then, I was just re-posting piece I'd been writing for Shelf Awareness anyway). In that quiet space, I walked away from most all of my writing projects and the computer and, as made sense for me, the internet (though I still overshare on Instagram, and I'm not even sorry about it). I contemplated giving this space up and calling it quits, weighing the amount of work it is to find the time and energy to write something meaningful against the ever-limited amounts of time and energy I seem to have these days. But something in me couldn't let go. Because even though I haven't been the best blogger, or the best reviewer, or the most consistent writer of late, a not-so-small part of my heart loves this space I've carved out, the time I find to write about books and running and the things that make me excited. In a world full of bad news, I want to make an effort to make space for the things I'm passionate about. In a life full of ups and downs--and 2017 brought quite a few downs, both personally and politically speaking--I want to have a space to think through my thoughts, and this is that space. I'm not big on resolutions; I always find a list of lengthy, detailed goals gets lost by the end of January and forgotten by the end of February. In recent years, I've tried to focus my year around a single word instead: in 2015 it was "light", and in 2016 it was "savor." I rebooted the same word for 2017, recognizing that my attempts to savor the small moments of great joy hadn't quite gone as planned for 2016, and giving myself the time and space to try again. Time and space and trying again are themes for 2018, I think. But I want to be intentional about what it is I take the time and space to try again. There are things, after all, that we just aren't meant to do. There are projects we need to close, chapters we need to walk away from, opportunities we need to decline. Then there are things we need to continue to make space for with intention--like this blog, perhaps, or conversations with distant friends, or time to sit with our thoughts and do absolutely nothing at all. 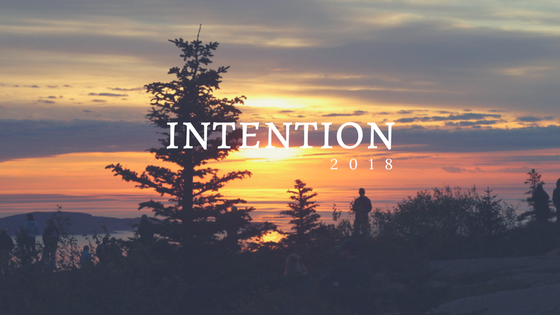 And so, if I have a word for 2018 at all, it is that: intention. 2. (medicine) the healing process of a wound. How apt. I chose the word before looking up its formal definition, and almost balked when I read the first line. "An aim or plan." I don't have those, after all. My aim, my plan is merely to be open to what comes my way. To live with intention, to use my time, my space, and my energy in ways that allow me to find my aim or my plan, rather than vice versa. But that second line. "The healing process of a wound." It's a medical definition, of course, not one used in common language. But how appropriate to 2018. How fitting for the year after a year that kicked while we were down. How perfect for my intentions for the months to come. I won't wish for an easy year for any of us. I won't wish for a year of only ups, or a year devoid of challenges, or even a year that doesn't kick while we're down. But I will wish for you--and for myself--a year in which we can find the space to be intentional about how we use our time and energy. And may that intention be of both the linguistic and medicinal varieties.